If cooking is an art and baking is a science, then candy making is nuclear physics. Unlike my niece Jessica, a science whiz headed off to medical school, I've always been challenged in that area. Nonetheless, I love to make candy, even though my failures (like today's) probably outnumber my successes. 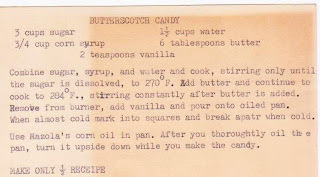 I set out to make Butterscotch Candy from a c. 1940s recipe card. 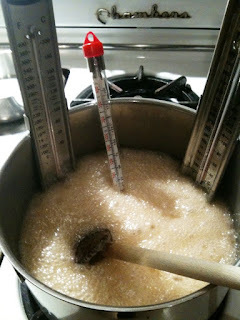 As you can see in the picture above, I had three candy thermometers and each registered a different temperature! (Part of the problem is that the numbers next to the mercury had peeled off, making reading the temperature very difficult.) 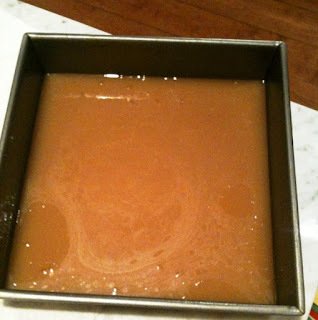 When the sugar syrup got to 284 degrees on one of the thermometers, I poured it into the prepared pan. I sensed immediately that I had overcooked it and just abandoned the whole thing. That, I learned was my mistake. The candy was fine -- if it was meant to be hard candy (and not of caramel consistency). But by the time I figured that out, it was too late -- I didn't cut the candy into pieces when it was still warm and somewhat pliable. 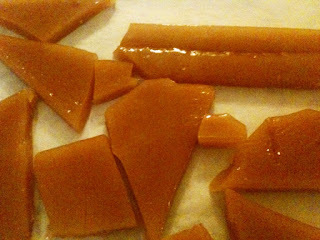 So now, I have a whole mess of butterscotch candy that's either too big or awkwardly shaped to really eat (though I've been enjoying it all day -- tastes like the gold cellophane wrapped Schraft's candy, without the chemical aftertaste). All I need is one of those machines that tumble rocks into smooth stones, and I'd be all set. 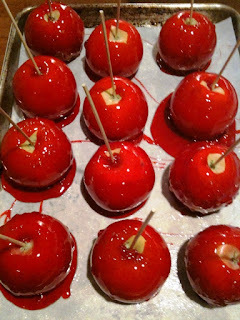 The candy apples, pictured above, were a success this past Halloween, but made from a modern day recipe available (for a couple of bucks) at BetterBaking.com, a site run by Marcy Goldman, a wonderful baker and writer. great pictures!! i don't know about physics but those apples and butterscotch shapes remind me of geometry! !